I suppose it makes sense that the images and video clips released so far to promote the next DC Animated film, Superman vs. the Elite, revolve around the Elite, since everyone already knows Superman. The original cartoon film is due out on home video June 12. For more information, I’ve previously posted the trailer and more information on the DVD and Blu-ray versions. 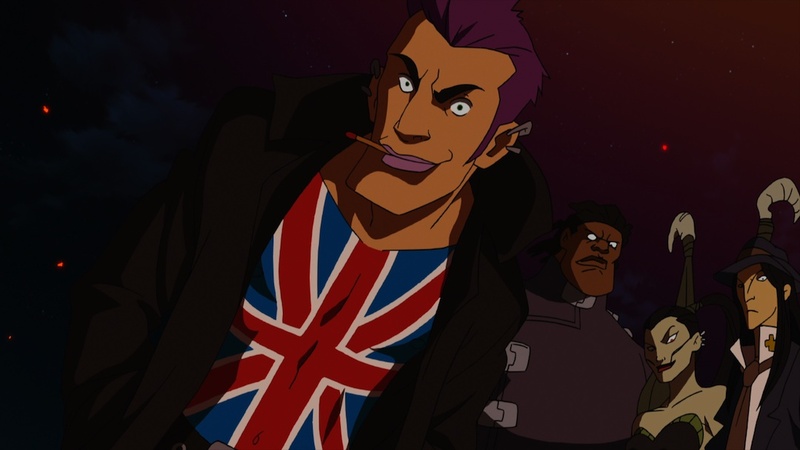 They’re led by Manchester Black, played by Robin Atkin Downes. Other Elite members, all created by Joe Kelly and Doug Mahnke, include Coldcast (voiced by Catero Colbert) with electromagnetic powers; Menagerie (Melissa Disney), a bat-woman with pet snakes; and The Hat (Andrew Kishino), my favorite, because it’s such a silly yet unbeatable superpower, having a magic hat, and a ridiculous reduction of the character he’s inspired by, the Authority’s Doctor.